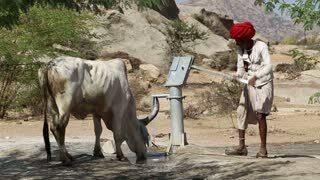 Search Results for "cow india"
JODHPUR, INDIA - 14 FEBRUARY 2015: Man drawing water from pumping station for a thirsty cow at field in Jodhpur. JODHPUR, INDIA - 5 FEBRUARY 2015: Cow standing on the road in city eating from trash bin. 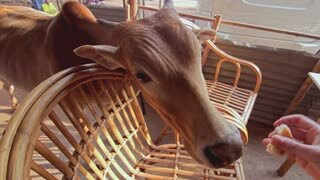 MUMBAI, INDIA - 9 JANUARY 2015: Cow drinking from bucket while Indian man holds her on a leash. HAMPI, INDIA - 28 JANUARY 2015: Cows walking on the road in Hampi, man and a child watching them. 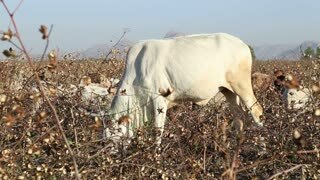 JODHPUR, INDIA - 14 FEBRUARY 2015: Cows pasturing among dry branches at field in Jodhpur. VARANASI, INDIA - 25 FEBRUARY 2015: Cow and local woman with basket on head walking to busy street in Varanasi. VARANASI, INDIA - 19 FEBRUARY 2015: Cows at street in Varanasi, with man passing by. HAMPI, INDIA - 28 JANUARY 2015: Cow on the street in Hampi in the evening. 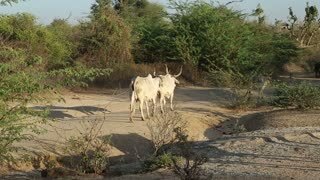 JODHPUR, INDIA - 14 FEBRUARY 2015: Cows walking down the rural road in Jodhpur. JODHPUR, INDIA - 14 FEBRUARY 2015: Cows at field in Jodhpur with portrait of their local keeper. 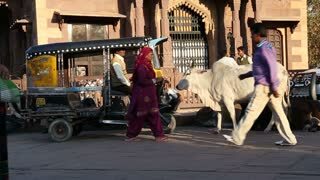 JODHPUR, INDIA - 11 FEBRUARY 2015: Cow standing by rickshaw at street in Jodhpur, with people and vehicles passing. 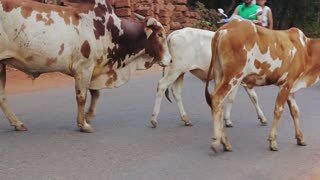 GOA, INDIA - 26 JANUARY 2015: Cow walking down the street while vehicles and kids pass by. 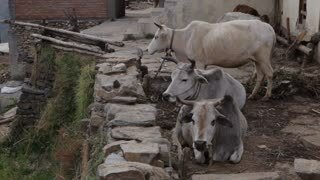 VARANASI, INDIA - 25 FEBRUARY 2015: Cows walking down the city stairs in Varanasi. VARANASI, INDIA - 20 FEBRUARY 2015: Cow tied in a narrow street in Varanasi, with people passing by. VARANASI, INDIA - 25 FEBRUARY 2015: Cow in Ganges river, with man sailing in background. HAMPI, INDIA - 28 JANUARY 2015: Cows walking on the road in Hampi. 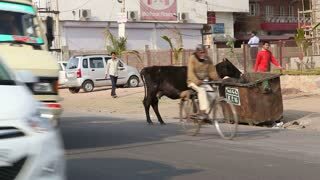 JODHPUR, INDIA - 15 FEBRUARY 2015: Cow and men at street in Jodhpur, with vehicles passing. 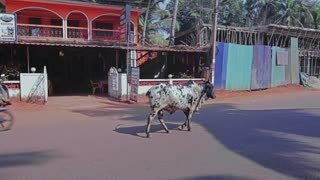 GOA, INDIA - 26 JANUARY 2015: Cow with injured foot walking using foot prosthesis down the street in Goa. JODHPUR, INDIA - 12 FEBRUARY 2015: Cow standing by the garbage can at busy street in Jodhpur. 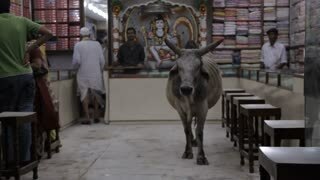 HAMPI, INDIA - 28 JANUARY 2015: Cow walking in middle of the night on the streets of Hampi. 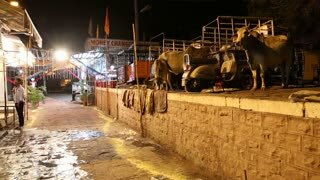 JODHPUR, INDIA - 17 FEBRUARY 2015: Cows standing at higher street ground while people stand at street. 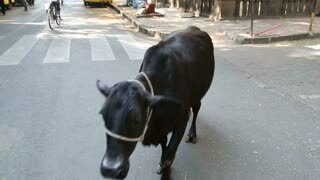 MUMBAI, INDIA - 10 JANUARY 2015: Black cow passing the street in Mumbai, close up. 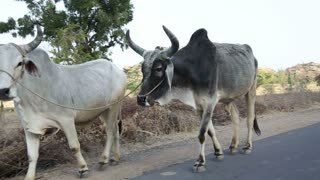 JODHPUR, INDIA - 13 FEBRUARY 2015: Two cows walking down the rural road in Jodhpur. 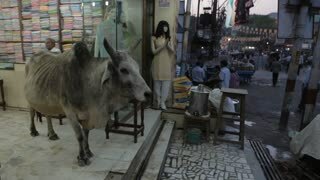 JODHPUR, INDIA - 5 FEBRUARY 2015: Two cows standing on the street in Jodhpur. Detail on the heads of a pair of calm and grazing sacred cows at the Hindu Kapaleeswarar Temple, Chennai, India. 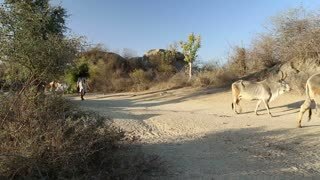 HAMPI, INDIA - 28 JANUARY 2015: White cow on a leash standing at the field. 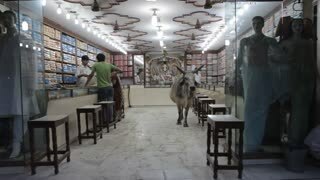 VARANASI, INDIA - 19 FEBRUARY 2015: Man finishing cow milking at street in Varanasi. 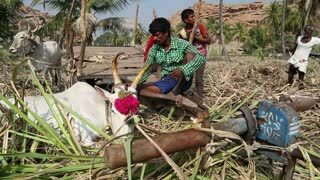 MUMBAI, INDIA - 13 JANUARY 2015: Man bringing cows to field for pasture. VARANASI, INDIA - 25 FEBRUARY 2015: Boy implying cows at shore of Ganges river. 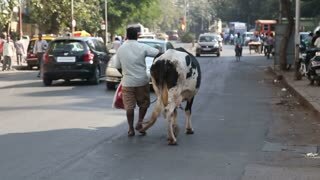 MUMBAI, INDIA - 9 JANUARY 2015: Man leading a cow on a leash through a busy street in Mumbai. JODHPUR, INDIA - 14 FEBRUARY 2015: Man carrying branches and cows passing down the sandy road in Jodhpur. VARANASI, INDIA - 25 FEBRUARY 2015: Woman giving food to cow standing by a wall in Varanasi.